United Way’s decision to shift funding away from senior services means trouble for Meals on Wheels, the meal-delivery service for the elderly that can be the difference between independent living and a nursing home. Peter Lind has been caring for his wife, Georgette, 81, in their Bellevue home as she’s gradually lost more and more of her thoughts to Alzheimer’s. She can sometimes remember the name of longtime neighbors and her first horse when she was a girl. But many of her observations start and stop, with a semblance of syntax but no discernible meaning. “It’s overwhelming sometimes,” said Lind, 85, a former Navy pilot and flight instructor who served in Korea, worked as an attorney and sold insurance until his wife’s illness forced him to give up the business to be with her. Last year, he turned to Meals on Wheels, to get some help and ensure they both ate regularly. “I’m an abysmal cook,” he said. But Meals on Wheels, the most recognizable program for seniors across the country, may not be able to serve all the new clients who need it. 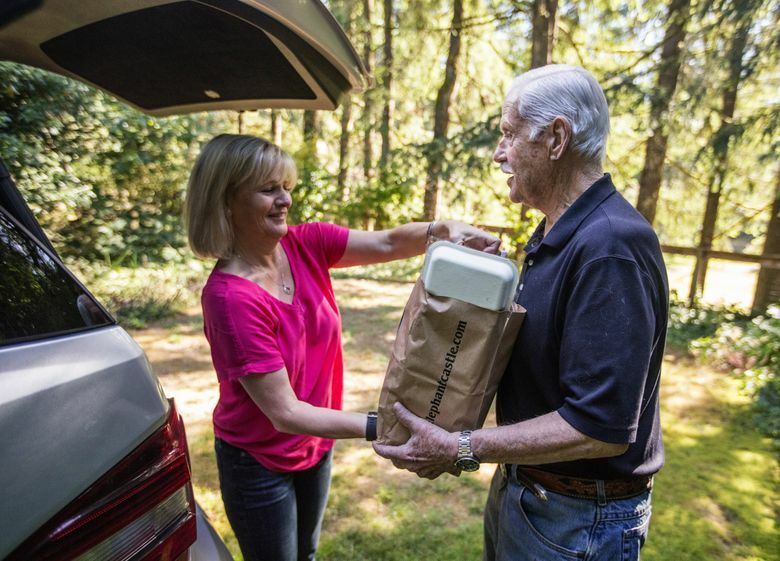 Sound Generations, the nonprofit that runs the weekly meal-delivery program in King County, told clients in July it will have to establish a wait list of about five months. That’s also the case in Snohomish County, where a wait list of 200 people has grown to 500. It’s the latest ripple effect from the decision last year by United Way of King County and United Way of Snohomish County to cut funding for many senior programs. The charitable-giving organizations have shifted their priorities from providing a safety net across a broad continuum of needs to focusing on poverty, homelessness and youth. Many social-service providers worry that the shift in funding will leave vulnerable seniors without the necessary resources to remain independent and living in their own homes. The cuts come at the same time people are living longer and more baby boomers are entering their senior years. Sound Generations, formerly Senior Services, saw its United Way funding drop from $800,000 in fiscal year 2015-16 to $108,000 for 2016-17. The city of Seattle has committed an additional $80,000 for the remainder of the year, but leaders of the nonprofit estimate they will need an additional $220,000 to eliminate the wait list. Paula Houston, CEO of Sound Generations, said that among the senior services the agency provides, Meals on Wheels will take the biggest hit. Between 2012 and 2015, she said, the number of people in King County who received Meals on Wheels rose 38 percent, to 2,700 seniors. “Meals on Wheels may be the only thing keeping a senior out of a skilled nursing home or back in the hospital. The shock and grief of having to leave home can be prevented,” Houston said. Coalitions of nonprofit agencies say their members face tough choices between reducing the level of services they provide or increasing fundraising efforts or support from other funders, including cities. Marnie Maraldo, coordinator of the Eastside Human Services Forum, said cities from North, East and South King County have seen requests totaling nearly $18 million for 2017-2018 or about $8 million more than what’s available in city budgets for human services. “We’re excited about their (United Way’s) focus on homelessness and youth, but it comes at a cost,” she said. Maraldo said that, for her, the issue is personal. Her mother, 81, lives alone in Oregon with the beginnings of dementia. Help from Meals on Wheels reassures Maraldo that her mother has someone looking in on her regularly and delivering nutritious food. She noted that her mother’s income was cut in half when her husband died a year ago. “We say by where we put our dollars what we want our community to look like,” Maraldo said. In King County, about 9 percent of seniors live in poverty. The median household income of people 60 years and older is $50,000 — meaning half make less, according to statistics from the U.S. Census American Community Survey. There is no income threshold to qualify for Meals on Wheels. Rather, providers say, priority is given to people who lack transportation, can’t do their own shopping or can’t safely cook. Those same population statistics show that by 2040, one-quarter of the King County population will be 60 years old or older. Steve McGraw, CEO of Senior Services of Snohomish County, argues that seniors have worked hard, paid taxes, contributed to their communities and deserve support at the end of their lives. “Community resources play such a crucial role in helping older people have quality of life and dignity,” he said. 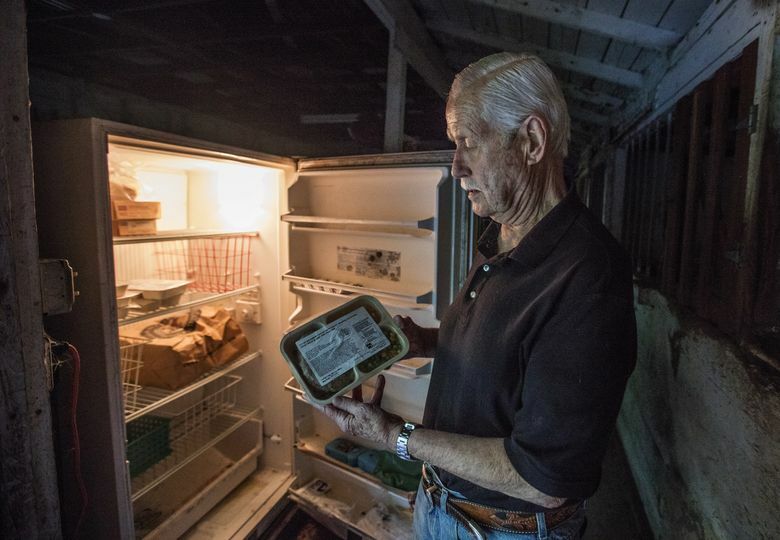 For Peter Lind, the weekly delivery of 10 frozen meals allows him to keep his wife in their home. He recalls that she found the vacant lot on which the house was built in Bellevue 50 years ago, served as the general contractor during construction and raised their two sons there. “She loves it here,” he said. The Linds’ Meals on Wheels’ driver, Leigh Ballantyne, said she can’t be with her own aging mother in Texas. Helping people on the Eastside is her way of supporting the elderly. She knows the Linds by name and checks on their well-being when she visits. She’s one of the few people the couple sees each week. Peter Lind said he went to one meeting of a support group for Alzheimer’s caregivers, but worried the whole time about Georgette. “She wanders,” he said. He hadn’t heard that funding had been cut to Meals on Wheels and threw back his head in relief when Ballantyne told him that current clients would continue to get their weekly meals. She gave him a hug and told him to hang in there. “He can’t do it all,” she said.